The Ideas (arch du triumph) mapped by Vi Ha ©, Michael Parker 2016 Photo Credit: Panic Studio LA courtesy of the Department of Cultural Affairs, City of Los Angeles. Michael Parker promises he isn’t a history buff, but his site specific artwork reflects a clear understanding of Western history and its impact on the modern world. He derives much of his inspiration from the most essential element of life: water. In his Current: LA Water Biennial piece entitled, “The Ides (arch du triumph) mapped by Vi Ha,” Parker explores the complexity of power as seen at the Port of Los Angeles which provides 40 percent of the nation’s goods. Parker’s goal was to draw attention to the international power balance in relation to shipping and commercial business. 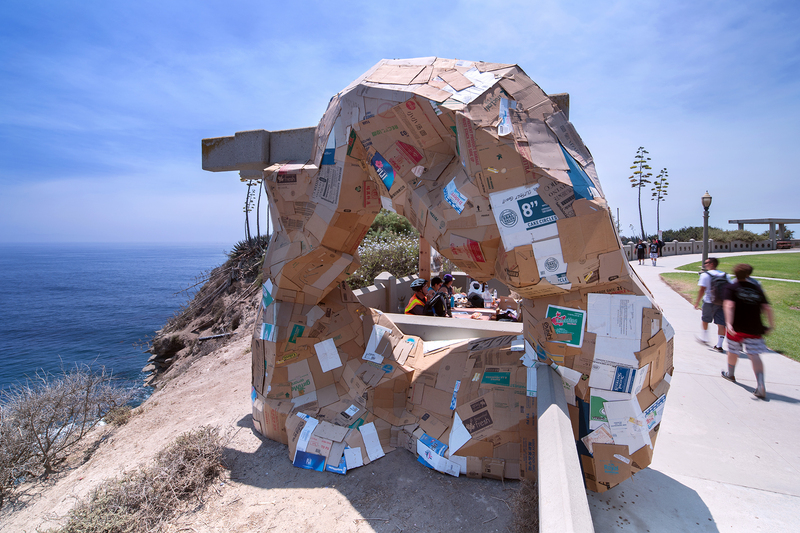 Although Parker’s work, which debuted at Point Fermin this July, has been misconceived as a “giant cardboard doughnut,” his work is intended to represent a triumphal arch, which symbolizes power. The structure is made up of dozens of cardboard boxes, all of which were donated by local mini-malls or stores. The boxes themselves came through the very port that the art oversees, and are originally from a variety of international locations. Photo Credit: Panic Studio LA courtesy of the Department of Cultural Affairs, City of Los Angeles. Beach-goers speak to the artists about the artwork as it is in the final stages of being installed. Below is a Q&A with Parker, who is currently in the midst of providing artist talk-backs. The biennial is open to the public until August 14th. What materials were used to create this structure and how were they assembled? What do they represent? What do you want visitors to take away from seeing your piece? What challenges arose from working outdoors, specifically on a cliff overseeing beach? How does the work represent LA as a whole? How does the art reflect the mission of Current LA? How was the process of collaboration?